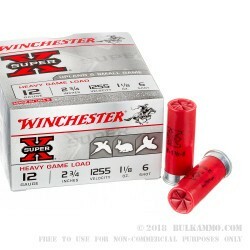 This 12 Gauge shotshell from Winchester’s Super-X line of ammunition is loaded with 1 ⅛ ounces of #6 lead shot. 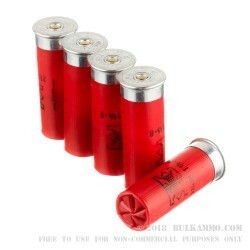 Its heavy shot charge of over 250 .11” diameter pellets provides a large, powerful barrage to help hunters take down game reliably. 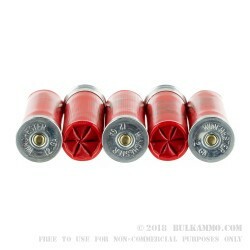 This shell also offers a one-piece hinged wad for reduced felt-recoil and tight, uniform patterns, as well as a 209 primer and clean burning powder for reliable ignition and a consistent muzzle velocity of 1,225 fps. #6 lead shot’s reliable foot wide kill zone at about 35 yards makes it optimal for taking upland game birds including grouse, partridge, dove, and even turkey with the right aim, as well as squirrel and rabbit. You’ll find this middle of the road birdshot performs admirably for casual target practice as well, although it has a tendency to ricochet off of some sturdier materials. Save the glass bottles for the 454 Casull.